ST. LOUIS (CNS) — Normally, few would associate the two men as being in a brotherhood. One is African-American, in his 40s, the pastor at New Life Missionary Baptist Church. The other is Anglo-American, in his late 60s, a Catholic priest for the Archdiocese of St. Louis and rector of the Shrine of St. Joseph near downtown St. Louis. Before Oct. 22, they had never met, but at about 11 a.m. that day, they stood together in the foyer at St. Joseph rectory, linked not only as men of God but now as victims of violence. 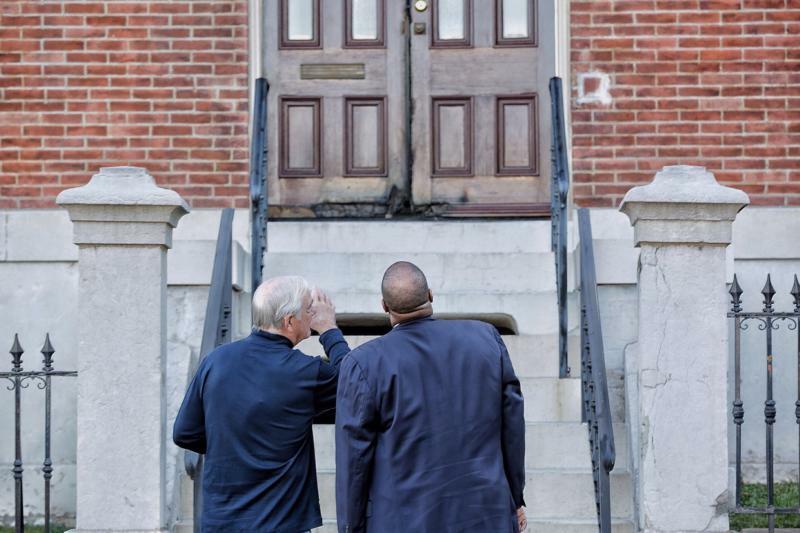 For the first time, Father Dale Wulderlich surveyed the damage to the rectory front doors from a deliberately set fire 10 hours prior — the seventh such arson at a St. Louis area church in two weeks. The Rev. David Triggs’ church in Walnut Park was hit five days earlier and, to this point, has suffered the most damage. Vinyl siding was melted and rafters in the small entryway were burned, but the sanctuary was unaffected, protected by double doors. Sunday services were held outdoors the next day. Likewise, interior doors kept fire out of the St. Joseph rectory; firefighters, alerted by smoke detectors and fire alarms, quickly extinguished the fire. Other than the doors themselves and the smell of fire, the rectory and the church were undamaged. As Father Wunderlich surveyed the damage, Rev. Triggs pointed to the mail slot on the rectory doors. In all of the fires, sanctuaries were undamaged. “Jesus said, ‘I am the door to freedom,'” he said. “I believe maybe this person was injured by the church, maybe he was disappointed by the church, and maybe he’s attacked our doors sending a message to the body of Christ that he has been maybe harmed or hurt by the church, maybe let down or disappointed. Rev. Triggs described himself as briefly angry then “very, very, very, very heartbroken” when he learned about the arson the morning of the 22nd before going to St. Joseph to show his support. “It took me to get down on my knees and find that pocket of peace that Christ has given us,” he told the St. Louis Review, newspaper of the Archdiocese of St. Louis. St. Joseph Shrine is the second Catholic church to be targeted by arson. St. Augustine in north St. Louis also was hit. “Brotherhood,” Rev. Triggs said, touching Father Wunderlich’s shoulder. “We’re all being vandalized, victims together,” said Father Wunderlich, who resides at Our Lady of Lourdes Parish in University City. When secular media suggested this kinship and brotherhood was something Father Wunderlich and Rev. Triggs would rather not have, Father Wunderlich shook his head, disagreeing. Luecking is a reporter at the St. Louis Review, newspaper of the Archdiocese of St. Louis.